Many brides like to follow time-honored traditions when they marry. Most like to wear a white dress. Some still like to be unveiled and given away by their Fathers. These deep-rooted traditions feel more like the rules of a wedding. The whole day follows a set of events that ends when the bride throws her bouquet into the crowd of hopeful single ladies. These unwritten rules are all part of the spectacle and joy of a big wedding. Many brides-to-be want their own weddings to conform to these rules. These days we have the internet to help us research what we need to do to prepare for our wedding day. In the past, our Mothers may have passed on family ideals and traditions for the big day. Our Mothers also pass on much of our jewelry that we wear for the wedding too. The bride’s jewelry is a big part of the overall style and glamor of the outfit. Pearls are the traditional choice for pendants and earrings. Tiaras and veil clips are often formed of small diamonds, although crystals create a similar effect. Often, the maid of honor or another family member will lend you some jewelry. I wore a ring that belonged to my mum! This takes care of the ‘something borrowed’ part of bride traditions. It is rare to combine ‘borrowed’ jewelry with ‘something blue’, though. Often, brides will wear a blue garter, rather than blue jewelry. When you were shopping around for designer engagement rings, you might have noticed that they are often paired with a matching wedding band. 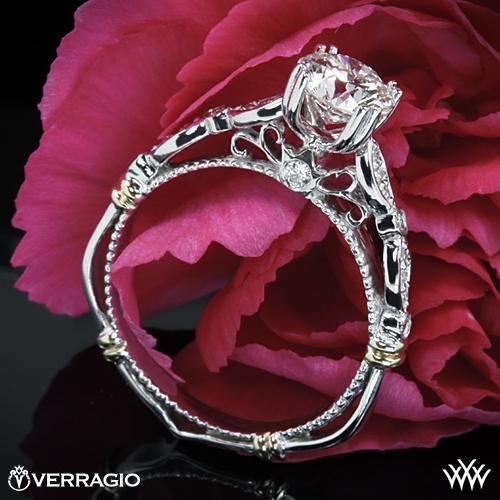 Many brides can become confused about whether to wear their engagement ring on their wedding day. This is actually a matter of personal preference. Some women feel uncomfortable wearing two rings. Others like to have both of the set worn together. If your wedding band and engagement ring don’t match, you can still wear both together if you choose. At your ceremony, your husband will place the band on your wedding ring finger. This secures your engagement ring on behind it. You might choose bands with the same color as the band of your engagement ring. Wedding bands have been quite plain in the past. These days, you don’t need to settle for a dull gold band. Precious stones, engraving, and the combining of other precious metals can be used. This makes for unique and beautiful wedding rings that you will be proud to wear every day. Now you have chosen your bands, you can choose which tradition you would like to follow during the ceremony. The two bands can be handed to celebrant by the Best Man. He is traditionally tasked with taking care of the jewelry until that moment in the ceremony. Often the Best Man is standing next to the groom until he has handed the rings over. He will then sit down, having completed that part of his job. Alternatively, you may choose to have a ring bearer. This could be young child holding a cushion with the rings on top. She would walk up the aisle at the right time in the ceremony to complete the uniting of the bride and groom. Of course, every wedding is different. You can enjoy your big day in any way you like. To the Bride and Groom!